College is often considered as the most the surest lucrative career. California is a state with so many colleges and universities and the people living there are educated. Education is power and also knowledge comes with both. In searching for a college degree in California, here are the most 20 college majors and careers. 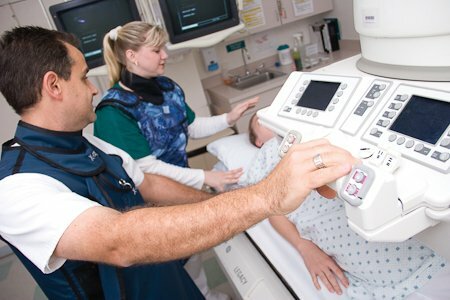 These are healthcare professionals who perform diagnostic imaging procedures such as magnetic resonance imaging scan (MRI), X-ray examinations, and computed tomography (CT) scans. Radiology technologist is responsible for accurately positioning of patients and ensuring that a quality diagnostic image is produced. They give assists to physicians and radiologist, that reads the images and diagnose illness and injury, providing assist on oncology teams in delivery radiation therapy to cancer patients. The minimum educational qualification for this profession is a 2-year associate degree or 4-year degree, and are educated in anatomy, patient’s positioning, examination techniques, equipment protocols, radiation safety & protection, and basic patient’s care. After the completion of the program, a state-specific license exam is conducted and a pass is required to obtain a license from the Radiology Board of the State in order to have a career in radiology. The median annual salary earned by radiology technician in California is $62,761, with the lowest 10% earned per annum is $38,110 and the highest 10% earned per annum is $81,660. The employment growth rate for radiology technology is expected to increase by 9% to 12% from 2012 to 2024. Radiology technology as a career is all about performing medical imaging exams and administer radiation therapy treatments to patients. They also specialize in a particular examination technique such as mammography or bone densiometry, cardiovascular-interventional radiography, and sonography. They require specific skills when working with their patients, they include communication, kindness and patience skills. Event planners are professionals who coordinate and organizes meetings, luncheons, and other special events fro companies or individual clients. They make sure that events of any kind go on smoothly, including choosing a location, hiring caterers, entertainment, and other vendors, arranging lodging and transportation fro attendees. The minimum educational requirement for event planning is an associate’s degree or certificate in event planning or a bachelor’s degree in hospitality management, or public relations, marketing, communication, and business. Most employers prefer applicants with postsecondary education. They also require good communication skills, creativity, and interpersonal relationship. The median annual salary wage earned by event planners in Southern California is $46,020, with the lowest 10% earned per annum is $25,680 per annum, and the highest 10% earned per annum is $82,050. It has employment growth rate of 10% from 2014 to 2024, much faster than the average for all occupation. The event planners discuss events with clients to determine their needs and visions. Registering of guests at the event site, and troubleshooting any problems that arise before and during the events. Event planners review vendor’s bills and approve them for payment, and also visiting possible locations for an event. Fashion designers creates and designs original clothing, accessories, and footwear. They sketch designs, selection of fabrics and patterns and give instructions on how to make the product they design. Fashion designers promote clothing lines and designs to retailers and consumers, they oversee clothing designs from the final production. Fashion designers develop a design using computer aided programs, such as CAD to develop and create a design and work with other designers and merchandisers to create a design prototype. The minimum educational qualification require is bachelor’s degree in a related field such as fashion design or Fashion merchandising. These individuals make use of CAD technology during this program. In earning a degree in the above field, the course work includes color, textiles, sewing and tailoring, pattern making, fashion history and computer-aided design (CAD). Additional skills are required such as technical skills, communication skills, creativity, artistic ability, decision-making skills, and detailed-oriented skills. The median annual wage for fashion designers in California (Los Angeles, Orange County and San Francisco is $64,030, the lowest 10% earned per annum is $33,260 and the highest 10% earned is more than $129,380. The median annual wages differs in different areas of specialties, Fashion designers in the management of companies and enterprises earns about $80,470 per annum, while Apparel manufacturing earns $67,080 per annum, Apparel, piece goods, and notions merchant wholesalers earn $62,120 per annum, and specialized design services earns $57,020 per annum. The employment growth rate is 3% from 2014 to 2024, which is slower than the average for all occupation. Fashion designers are involved from concept to finish in the development and production of clothing lines. Moreover, a few designers are able to work their way up in the industry through on the job experience. Designers must have an in-depth knowledge of fashion design concepts, sewing, apparel design and garment construction, and be familiar with the different types of textiles and industry trends. Most designers are specialists. They may specialize in women's apparel, children's clothing, or men's wear. Healthcare management is business oriented and is responsible for developing policy, coordinating and directing the planning, maintaining an efficient and effective organizational structure, managing the organization’s assets, and analyzing the organization’s profitability and efficiency. A health care management career requires leadership skills, specialized knowledge of the healthcare industry, financial management, human resources, health care technology and informatics. The minimum educational requirement is a bachelor's degree in healthcare management or an associate degree or high school diploma in pharmacy technician, Health information technician, or other related health fields. An experienced level is also required in health administrative and managerial role involved in the overseeing both the medical and business side, as an entry position. A master’s degree is also required in healthcare management. The median wage earned by healthcare management is $94,500 per annum. The salary earned by health management is dependent on the state of employment. It has an employment growth rate of 17% from 2014 to 2024, which is much better than the average for all occupations. Healthcare management is about working to improve efficiency and quality in delivering healthcare services, develop departmental goals and objectives, and communicate with members of medical staff and departmental head. They manage the finances of the facilities and create work schedules, recruit, train and supervise staff. Financial Advisors are professionals who help individuals makes a wise decision concerning the management of their money, they assess a person’s financial position, understanding their needs, and goals after which making recommendations on how to best achieve them. Financial advisors help a client in the investing of his funds and also giving advice on investment plans and policy. They give a recommendation on investment products and services that are suitable for prospects and client’s based on their objectives, resources, time zone, risk profile, and preferences. The educational qualification required by the profession is a minimum of a Bachelor’s or an associate or masters or Ph. D. degree in accounting, finance, economics, mathematics, law or business. However, a certificate course is also required such as Certified Financial Planner (CFP), Personal Financial Specialist (PFS), Chartered Financial Consultant (ChFC), and Chartered Financial Analyst (CFA) which is recommended by the National Association of Personal Financial Advisors (NAPFA). In addition to this, they require several skills such as analytical skills, critical thinking skills, communication skills, and must engender trust with their clients. The median wage earned by financial advisor per annum is $108,090, with the lowest 10% earned per annual is $35,500 and the highest 10% in California earned is more than $187,199 per annual. The employment growth rate for this profession is 27% increase from 2012 to 2022, which is much faster than the average for all occupation. This career is all about understanding client’s short and long-term financial goals, such as retirement, savings, and also offering several ways to help achieved their client's goal. They give explanations and recommendations on different types of investments and decide the type and level of insurance that is good for their clients. They make sure that tax forms and other financial documents comply with regulations. Human Resource Managers are professionals who plan, direct, and coordinate the administrative functions of an organization. However, they oversee the recruiting, interviewing, and hiring of new staff; consult with top executives on strategic planning and serves as a link between an organization’s management and it’s employees. They handle staffing issues, such as mediating disputes and directing disciplinary procedures. The minimum educational qualification for this profession is a bachelor’s degree in human resources or another field such as finance, business management, education, or information technology. A Master’s degree in human resources, labor relations, or business administration is also required for the job level. A license, certificate, and registrations are also required and are issued by The Society for Human Resource Management. They also require interpersonal skills, leadership skills, organizational skill, speaking skills, and decision-making skills. The median annual wage for human resource managers in California is $104,440, with the lowest 10% earned is less than $61,300, and the highest 10% earned is more than $187,200. The salary wage differs in top industry such as those in Management of companies and enterprises earning $118,320 per annum, Professional, scientific, and technical services earned per annum is $117,640, Manufacturing earns $100,710 per annum, Government earns $94,280 per annum, and Healthcare and social assistance earns $89,090 per annum. The employment growth rate for this profession is 9% from 2014 to 2024, faster than the average for all occupations. Human resource managers plans, link organization’s management with its employees, plans and oversee employee benefits programs. They serve as a consultant with other managers advising them on human resource issues, such as equal employment opportunity and sexual harassment. Wedding dress or Bridal consultant are person’s who specializes in retail sales of bridal gown shops or boutiques and work one-on-one with brides to help them find gowns and accessories. They measure brides and use their knowledge of fashion trends to help select dresses that will best flatter a bride's body shape and size. The educational requirement for this career is either a degree in fashion designing or certificate program could beneficial. In addition to this, some skills are required such as customer service skills, verbal and written communication skills, sales, interpersonal communication skills, teamwork, multitasking, organizational skills, and computer basic skills. The median annual wage earned by Bridal Consulting is $35,492, with the lowest 10% earned per annum is less than $24,680, and the highest 10% earned per annum is more than $72,050. However, experience and skills affect the salary range of bridal consultant. The employment growth rate for this profession is 10% increase from 2014 to 2024, much faster than the average for all occupation. Bridal consultant as a career gives assistant to prospectives bride, by finding wedding dresses, and accessories to suit their client’s needs. They give assist with tuxedos and dresses for other members of a wedding party, coordinating style and sizing of apparel, as well as ensuring that alterations are done correctly in a timely manner. Pharmaceutical science is professionals who are involved their time in the laboratory for discovering and learning how different compounds interact with the disease-causing cells and organisms. They develop, test, and manufacture new drugs for old and new existing diseases. They give advice on corporations or government agencies, including the Food and Drug Administration, on issues related to pharmaceutical development. The minimum educational qualification for this profession is a bachelor’s degree, or a master’s degree or Pharm.D. or doctorate degree. A license is also required after the completion of the program from the North American Pharmacist Licensure Examination (NAPLEX). They require additional skills such as good communication skills, analytical skills, time-management skills, sales experience, and interpersonal skills. The median annual wage earned by Pharmaceutical Science is based on the job options; Pharmacists earns $119,270 per annum, Pharmaceutical Researchers earns $92,900 per annum, and Pharmaceutical Sales Reps in California earn $89,170 per annum. Generally, Pharmaceutical scientist earns an average salary of $85,000 per annum for a starter. The employment growth for pharmaceutical science is expected to grow at 3% to 8% from 2014 to 2024, much faster than the average for all occupation. Pharmaceutical Science as a profession helps in working on improving the drug manufacturing process, ensure a constient quality of prescription medication, and study how diseases affect the body and what causes some persons to develop certain types of types. They are able to determine the most effective formulation and dosage for a specific drug. Special education teachers are persons that interact with general classroom teachers, parents, and administrators on a regular basis. Teachers must regularly assess student’s learning progress using critical thinking skills and work with students struggling with dyslexia, ADHD, learning disabilities or mental and physical handicaps. They prepare individualized learning plans based on each student’s needs. They help students in course curriculum at students pace and development of basic skills of life can function independently beyond the classroom. The educational requirement for this profession is based on public schools and private schools. Public school requirement for Special Education Teacher is a Bachelor’s degree, and a state-issued certification or license, while Private schools require a bachelor’s degree, but not a state-issued certification or license. A fieldwork is also required by the profession, which is referred to student teaching before they can work as a teacher. They require patience, resourcefulness, critical thinking skills, communication skills, and interpersonal skills as a plus to the educational level. In California the median wage earned per annum by Special Education Teacher is $56,800, with the lowest 10% earned per annum is $37,410, and the highest 10% earned per annum is more than $90,260. Special education teachers for secondary schools earns $58,500 per annum, those for middle school earns $57,280 per annum, Kindergarten and elementary school earns $55,810 per annum, and Preschool earns $53,990 per annum. The employment growth rate for the profession is 6% from 2014 to 2024, much as fast as the average for all occupations. Special Education Teacher as a career has the ability to assess a student’s skills to determine their needs and to develop appropriate teaching plans. Adapting of general lessons to meet the needs of students, plan, organizing and assigning of activities that are specific to each student’s ability. They discuss student’s progress with their parents, teachers, counselors, and administrators. They provide assistant in supervision and mentoring of teacher’s assistant who works with disabling students, and also help students transition from grade to grade and for life after graduation. Nursing is profession filled with emotions, and a personally rewarding career with excellent job prospects, with a wide range of areas of specialization, with salaries. Nursing is a diverse and lucrative field, that provide hands-on assistance to patients by administering medicines, monitoring and observing patient’s condition, providing care and support to patients, educating patients about health conditions, medical regimens, medications or other instructions. The educational qualification for the requirement of being a nurse is a 2-year associate degree which is usually the minimum required certification. A 4-year bachelor’s degree, that includes additional medical training and potential clinical training programs in non-hospital environments. A master’s degree is required. To obtain to work in Nursing fields is a Bachelor of Science/Nursing credential, bundled with health/medicine-related master’s certifications is required. The salary of this profession is based upon the area of specialization, location, years of experience and a variety of other factors with Licensed Practical Nurse (LPN) had an annual salary of $42,490, Registered Nurse (RN) annual salary scale is $67,490, while Advance Practice Nurse (CRNA ($157, 140), Certified Nurse Midwife ($92, 510), Clinical Nurse Specialist ($102, 670) and NP & FNP ($98, 190). They require communication skills, compassion, emotional stability, and organizational skills. The employment growth rate is 15% 2014-2024, much faster than the average occupation. The profession is all about taking care of patients and also assisting other medical personnel in hospital and clinics; with its diverse specialties, one can fully consider this profession as a career. They operate and monitor medical equipment, gives a detailed explanation on what to do at home after treatment. Nurses work hand-in- hand with doctors and other healthcare professionals, administering of patient’s medications and also treatment.